Graduate students led by Bill Lopez are taking modern technology to the grave. After guiding classes on tours through Lincoln’s Wyuka Cemetery for more than 15 years, Lopez and students in the Master’s of Elementary Teaching program have researched the history of select graves and made that information available electronically. The information is accessed online through Electronic Quick Response Codes posted at Wyuka and a smartphone. 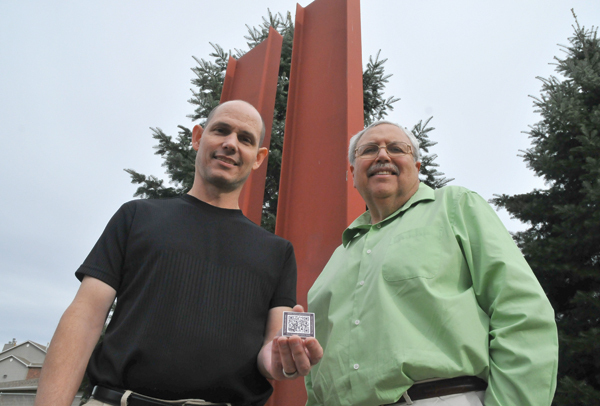 The “guy” is Randy Kassebaum, who has developed the technology to imprint QR Codes on long-lasting ceramic blocks. Lopez and Kassebaum had partnered on three similar projects at Wyuka — the 9/11 Memorial; serial killer Charles Starkweather; and Walter Dameron, who was killed in a head-on train collision in 1911 in western Nebraska. Lopez took the students on his standard tour, though this time the teacher held back a few facts. Paired into teams of two, the students selected graves that interested them and went to work on the research. “I let the stones talk to them,” said Lopez. “It was interesting because I thought the students would pick more grandiose things. Several of them decided that meant the family had money and in death they continued to show off. The students decided those families had enough exposure and selected more common people. One of the student teams — Katie Mohr-Wassinger and Heather Harris, both graduate students in elementary education — selected the graves of the Walton family. Searching through census records, newspaper clippings, the Nebraska State Historical Society archives and myancestry.com, they learned that the Walton family had nine children, six of whom died in 1882. In 1891, the mother died three days after living through a gas-stove fire. The story continued to see the father remarried, divorced and institutionalized. The remaining three siblings also died — two by suicide. The father, a wealthy property owner, remarried and was quickly divorced. Kassebaum met with the students throughout the project, providing web design guidance. While he plans to continue to have graduate students research Wyuka graves, Lopez may also see the project expand in the future. Lopez also believes Nebraska school teachers may be interested in adopting small rural cemeteries and developing a similar QR Code project.